Full polymer chassis (in a weapon born when the Steyr AUG was still regarded only as a "technology demonstrator": the production of the LAPA started in 1978 after a few years of development; and still today, most if not all weapons do NOT use a fully-plastic housing); 3-rounds burst capacity (something seen before only in the abortive Belgian FN CAL, and which would have taken some years to popularize, again in a Belgian weapon like the FN FAL, then in HK roller-delayed blowback weapons like MP5 and HK-33); manual safety replaced by a trigger disconnector (the weapon was secured yet remained ready to fire at any time, first round required a long, heavy double-action trigger pull which basically prevented any accidental discharge; the only two other firearms I can think of that have or have had this system implemented are/were both made in Italy, specifically the SITES M-4 "Spectre" sub-machinegun and the Beretta ARX-160 assault rifle in its Year 2008 prototype, it seems that the option will be discarded in the production-grade weapon). The LAPA FA was an interesting weapon, light, affordable (cheap as hell to make! ), apparently very reliable. Its dismissal was more political than due to technical faults of the project. I wouldn't dislike to see it coming back in some form; some manufacturer in the so-called "West" might as well start making a civilian-grade semi-automatic knockoff, possibly "modularized" under modern technologies and following the current trends, using an 1:9 pitch barrel for both .223-Remington and NATO-grade 5'56x45mm ammunition, using rails, all that stuff. 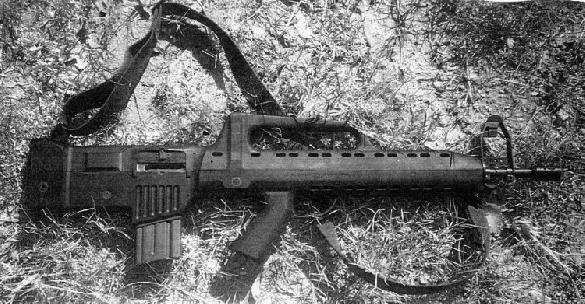 I would retain the original full-polymer chassis since it would definitely be less likely to become EXTREMELY HOT after rapid fire than, to say, a full aluminium chassis (like used in the Bushmaster M17-S).